The award winning SenseNET CANpod features all of the connectivity required to implement powerful and inexpensive solutions for public and commercial in-vehicle network applications. The SenseNet CANpod can be configured with 802.11b/g wireless network support, USB, CAN, and/or Digital I/O, Isolated Power Supply. Custom versions of SenseNET CANpod are available for customers with unique requirements or price sensitive applications, such as analog I/O. Additionally, OEM licensing of SenseNET CANpod technology is available for customer re-branding or manufacturing purposes. In 2013, CubicLabs celebrates its 20th year of providing its innovative SenseNET technology for the transportation, automotive test and development marketplace. Comprised of uniquely powerful hardware building blocks, network and software protocols, SenseNET technology has allowed OEM's to leverage our existing technology to realize powerful embedded applications in a fraction of the time required for engineering new products from ‘scratch’, at costs well below industry norms. OEM software which has been written for the SenseNET command protocol may be easily re-used for new projects developed using SenseNET hardware modules. Systems may be quickly developed with off the shelf hardware and then optimized for production purposes using an appropriate hardware subset for the lowest possible bill of materials cost. Software applications using the SenseNET API may be written in Java, C, VB, or any other language of choice. SenseNET embedded hardware modules have been developed for many 8, 16 and 32 bit microcontroller platforms, allowing the developer to scale up or down the price and performance of target applications while maintaining systems and software compatibility across product lines. Because hardware platforms running SenseNET have real-time device drivers already written for them, engineers developing new applications can focus on the application itself, instead of writing and debugging low level drivers for new (and often unfamiliar) hardware. The SenseNET device driver suite includes support for vehicle network protocols such as CAN, J1850, KW2000, J1939, J1708 and ISO-9141. This built-in support inherent in the SenseNET API relieves the developer from writing highly specialized software for these protocols in order to be productive. Likewise, analog and digital I/O support which is built in to the SenseNET architecture allows developers to control and monitor complex systems without having to master the creation of low level device drivers required for implementation. The following overview of specific projects which utilize SenseNET is intended to offer concrete examples of the ease with which powerful applications may be effectively developed utilizing SenseNET technology. A newly designed Oil Soot Sensor was used for oil quality and engine health monitoring. This smart sensor is microprocessor controlled and features a serial interface for connection to a host system. The SenseNET platform used for the Oil Soot Sensor acted as the host system for the sensor, and contained all of the application firmware necessary for control and operation of the sensor. The specialized application firmware used SenseNET’s built in command language to speed application development and improve system reliability. SenseNET’s built in TTL level serial port allowed direct connection to the sensor without requiring the addition of serial line drivers to the sensor’s electronics, thereby reducing sensor cost and keeping the sensor PCB footprint to a minimum. SenseNET’s built in DC to DC converter offers electrical isolation of the sensor from the vehicle power system. SenseNET provides isolated excitation for the Oil Soot Sensor electronics, thereby eliminating the need for a dedicated isolated power supply for the sensor. The Oil Soot Sensor uses a proprietary command set for operation and control. SenseNET hosts a dedicated sensor command interpreter which specifically addresses the command structure and performs all command parsing needed to command the sensor and interpret the results. SenseNET performs all operations on raw sensor data, such as applying scale and offset values required to convert the data into useful engineering units. All J1939 CAN messaging for the Oil Soot Sensor is performed using the SenseNET J1939 standard protocol stack. Data report rate and messaging format is fully customizable. Oil Soot Sensor application firmware is fully programmable in circuit, without having to replace chips or remove the SenseNET from it’s sealed enclosure. All Vehicle systems are monitored and diagnosable using a dedicated SenseNET configured as a J1939 diagnostic access point. SenseNET provides a built-in J1939 CAN network to 802.11b/g wireless bridge. This allows for monitoring of any system network packets without having to physically connect to the J1939 network. Additionally, CAN packets may also originate from data received by the wireless bridge from any authorized node on the 802.11b/g wireless network. The primary interface with the SenseNET is an 802.11b/g (WiFi) digital radio port built in to SenseNET. 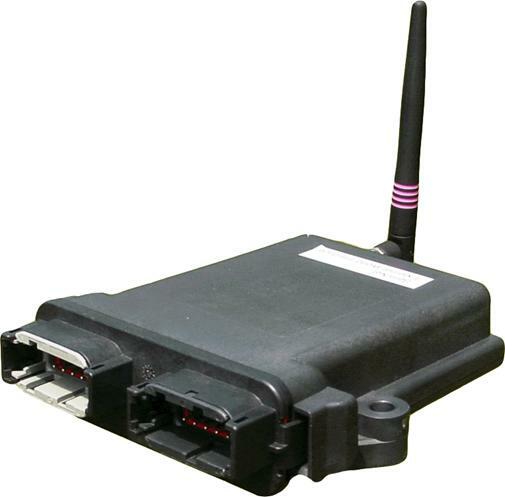 For security purposes the wireless network module may be enabled or disabled via J1939 CAN network commands or an actuator switch provided for physical control of 802.11b/g radio functionality. SenseNET provides these standard wired interfaces in addition to it’s built-in 802.11b wireless network support for direct connection to computers or other sensor systems. Application firmware is fully programmable in circuit, without having to replace chips or remove the SenseNET from the sealed enclosure. SenseNET may be configured to report raw sensor, gauge, or switch data, or to perform any scaling and offset calculations required to transform raw data into more useful engineering units. Data reporting is customizable and may be configured to broadcast J1939 messages at any rate or in response to a specific query. SenseNET systems are configurable to generate J1939 messages appropriate for any error or fault condition detected by the system.